Can you discover what insect I am from my tail and three clues? 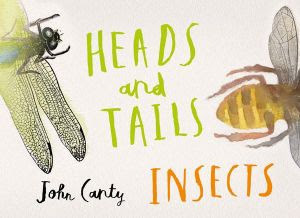 John Canty's new book, Head and Tail Insects, will lead readers on a page by page journey of insect discovery. Children will discover twelve familiar insects; bees, ladybugs and ants plus some other garden insects that are fabulous at camouflage. Head and Tail Insects contains 36 interesting insect facts like; where insects can be found, a description of their features, how they move, what they eat and the sound they make. Families and teachers can use the this book to encourage children to discuss, write and draw their own insect clues. At the end of this book there is one final surprise for children to discover, an animal that does not belong with the others. Do you know why? Canty has successfully given this timeless and popular topic an engaging and fresh feel. Head and Tail Insects will delight and engage a new generation of budding entomologists. Canty has created simple, bold and rich illustrations using watercolour and woodblocks that will appeal to the discerning eye of our younger readers. He has adapted many of the animal's line-work using Jim Harter's 1979 book, Animals: 1419 Copyright-Free Illustration of Mammals, Birds, Fish, Insects etc: A Pictorial Archive from Nineteenth Century Sources. Other books that your little entomologists may be interested in are; Mrs Peanuckle's Bug Alphabet by Jessie Ford, Natural History Collector: Hunt, Discover, Learn! by Mike Sanchez and Bugged: How Insects Changed History by Sarah Albee.